Video & CCTV Surveillance Plans & Installation for complete security. Video & CCTV Surveillance Plans & Installation for complete security. A video and/or CCTV surveillance system is a valuable security tool that can be used in a wide variety of applications. From business to the home, surveillance technology offers a simple way to monitor property, equipment, or people, to ensure increased protection, documentation, and increase response times if a problem arises. Surveillance systems also directly impact your bottom line by monitoring employees, customers, inventory, and equipment in any environment. Problem areas can be identified and monitored 24/7 internally or externally. Schools, construction sites, and commercial properties are other areas where video and CCTV surveillance systems can protect assets and people from unwanted or unlawful acitivities. At Echelon Protection & Security, we can incorporate a surveillance system into a comprehensive security package that includes highly trained and certified guards, fully capable of operating the equipment and providing you with detailed reports. We help you develop and maintain your security plan as your trusted partner, that will work with you to solve any security challenges that arise as you grow. Video surveillance systems offer a reliable way to monitor and record activity in any industry or setting. No matter what industry you’re in, adding surveillance to your security package increases safety while reducing risk and liability. Corporate, Commercial & Retail Property – Your corporate, commercial, or retail property can benefit greatly from a modern surveillance system. CCTV and video technology helps you maintain the security of your merchandise from the loading dock to retail floor on a daily basis. Surveillance is another tool to protect valuable equipment and materials, while ensuring the property is protected from vandals, thieves, or liability from accidents. We can develop and install a completely new system or integrate new technology to support your current system. In corporate, commercial, and retail environments, surveillance works in tandem with your security agents, whether they be plainclothes officers or highly visible, uniformed deterrents. 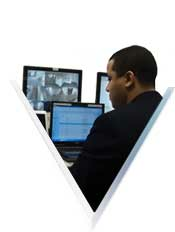 Our certified security guards can be fully trained to use your state-of-the-art surveillance equipment. Building and Construction Sites – Construction site theft and vandalism not only affects your bottom line, but may severely damage your reputation. Construction sites pose unique security challenges, especially if the site is large or has multiple points of entry that require constant surveillance monitoring. A CCTV surveillance system helps to protect materials, trailers, and equipment by providing your security officers with a means to have eyes in many places at once. Our surveillance experts will work with you to identify jobsite security challenges, as part of a comprehensive security assessment. Private Estates – Video surveillance systems protect your family and property whether you’re at home or away. Even the mere presence of highly visible camera surveillance can act as a deterrent to would-be criminals, but 24 hour surveillance ensures that any breaches in security can be dealt with immediately. Schools and Campuses – The safety of students and faculty on campus has never been under more scrutiny. CCTV surveillance offers a means to monitor campus entry points, school entrances, and everywhere in between. Not only does video surveillance help deter unlawful activity and protect property, but if the security of the school is compromised, response times by trained personnel are dramatically decreased, allowing for an immediate lockdown or the implementation of other emergency security protocols. Loss Prevention – Along with trained and certified security guards, there is no better way to prevent loss in a retail environment than with a modern surveillance system. Protecting your bottom line from internal and external theft poses a variety of security challenges, but camera surveillance can be focused on problem areas to define causes of loss and create documentation to prosecute those that seek to profit from it. Our digital surveillance can render high-resolution images that can be used to identify thieves and prosecute them in court. We will work with you to create a fully-realized security and surveillance package aimed at protecting your inventory and cash intake. • Full service organization representing best of breed manufacturers and providing factory trained and certified technicians. As security industry leaders, the experts at Echelon Protection & Surveillance are ready to help you develop a surveillance system that will work in tandem with your existing security protocols, or create an entirely updated plan. Our flexibility allows you to maintain, change, or upgrade your surveillance package as you see fit. Our affordable pricing also means that we can work within your budget to develop a CCTV and video surveillance system fully customized to your unique set of security challenges. Contact us today and speak with an security expert who can provide you with more detailed information about developing a fully integrated surveillance system for your industry.